Travel tips and photographs for Canada. Radium Hot Springs made a great base for our day hikes in less-crowded areas of the Columbia Mountains and Canadian Rockies, in a two-week vacation from Seattle. Having just sold our VW Eurovan Camper to be upgraded with an RV next spring, we instead drove our Prius V car. We rented accommodations with kitchen in Brisco and Radium Hot Springs (which are cheaper than in Banff and Canmore). 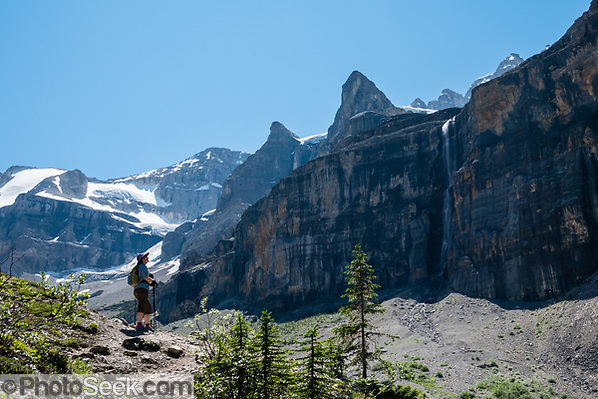 Two weeks from July 13-27 gave us eleven good day hikes in Yoho, Kootenay, and Banff National Parks plus Bugaboo and Peter Lougheed Provincial Parks. In Revelstoke National Park, the Skunk Cabbage Trail allowed us stretch our legs and eat lunch in a natural setting with giant leaves. On a hot day in Yoho National Park (85F), we hiked turquoise Sherbrooke Lake combined with scenic Paget Peak Lookout (7 miles round trip with 1920 feet gain). Cathedral Mountain and Mount Victoria North Peak rose dramatically above us near Kicking Horse Pass. Multiple trips through Kootenay National Park rewarded us with rows of Canadian Rocky Mountains reflected in the Kootenay River. A herd of scruffy mountain goats attracted a line of parked cars, but we drove onwards. On the spectacular Stanley Glacier Trail (6 miles round trip with 1200 feet gain), a waterfall plunged dramatically from the sheer walls of Stanley Peak. Just down the road, a worthwhile short walk is Marble Canyon, which cradles turquoise Tokumm Creek just above its confluence with the Vermilion River. For over 500 million years before tectonic forces thrust up the Rocky Mountains, a shallow tropical sea deposited carbonate sediments that became the limestone and dolomite rock seen here (not marble). A little further west are the orange-yellow Paint Pots. Historically, humans have mined these natural ochre beds, which formed by the accumulation of iron oxide around the outlets of three cold mineral springs. The Ktunaxa (formerly Kootenay), Stoney, and Blackfoot tribes collected ochre here for important ceremonies and trade. The yellow ochre was cleaned, kneaded with water into walnut sized balls, then flattened into cakes and baked. The red powder was mixed with fish oil or animal grease to paint their bodies, tipis (teepees), clothing or pictures on the rocks. In the early 1900s, Europeans hand-dug and sacked the ochre for hauling 24 kilometers via horse-drawn wagons to the Canadian Pacific Railway line at present-day Castle Mountain, where it was shipped by train to Calgary and became a pigment base for paint. 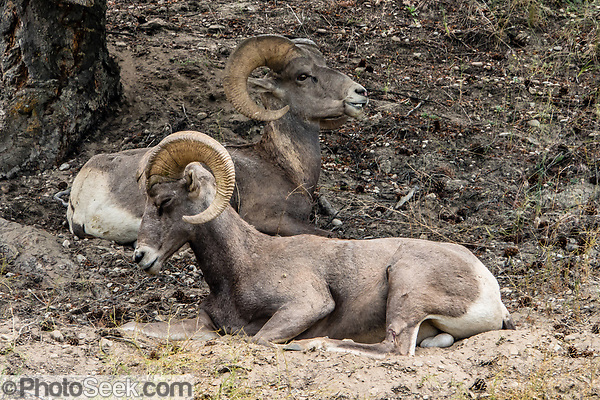 Every time I visit, wild Bighorn Sheep wander the outskirts of Radium Hot Springs village. Sinclair Falls is worth seeing from Juniper Trailhead, between Kootenay National Park entrance station and the hot springs. I booked our AirBnB (your signup supports my work) lodging in Brisco for 5 nights near my beloved Bugaboo Provincial Park, which is accessible via 75-minutes of dirt road in the Purcell Range of the Columbia Mountains. Although short and scenic throughout, the Spires Trail to Conrad Kain Hut is very steep (6 miles round trip with 2400 ft gain), forged by climbers drawn to this park’s soaring rock pinnacles. The sun-drenched slope (85 to 91 degrees F in the sun) overheated Carol, who turned back just above the ladder. Starting closer to sunrise would have kept us cooler. I persevered to be rewarded by one of my favorite views in the world: the Hound’s Tooth nunatak rising above Bugaboo Glacier, plus Snowpatch Spire and other pinnacles soaring overhead. While it still remains a wild adventure, consider hiking to the Lake of the Hanging Glacier, which features floating icebergs calved from Jumbo Glacier. The lake’s scenic reward was worth the effort of hiking over and under 60 fallen trees each way. Drive 1.5 hours west of Radium Hot Springs on the dirt Horsethief Creek Forest Service Road, preferably in a high clearance vehicle. On 2018 July 19, our low-clearance Toyota Prius V succeeded in crossing a planked wetland and two streams to reach the parking pullouts at 1 km from the trailhead, where a deep road dip finally blocked the car. From there we hiked 11.7 miles round trip with 3100 feet cumulative gain to the impressive lake. Fascinating lichen and rock patterns lie on stepping stones across the lake outlet. The spectacular Jumbo Glacier perches precariously above Lake of the Hanging Glacier. This wilderness wonder is threatened not only by global warming, but also from the huge Jumbo Glacier Resort planned/debated immediately south of Lieutenants ridge. For hikers, I recommend a newly-updated book covering this corner of BC: Mountain Footsteps: Hikes in the East Kootenay of Southeastern British Columbia (2018 Fourth Edition). (I call it “Strong Mountain Footsteps” for short.) This area has much to bring us back, such as hiking Jumbo Pass, Hourglass Lake, and Tanglefoot Lake. In Banff National Park, the scenic Boom Lake trail featured the mother lode of lichen polygon patterns, a holy grail for this nature travel photographer. Carol and I backpacked from North Interlakes Trailhead to Forks Backcountry Campground (10 miles round trip, 800 ft cumulative gain) in Peter Lougheed Provincial Park, Kananaskis Country, Alberta. From Forks Campground we day hiked to North Kananaskis Pass (13 miles round trip/2700 ft). 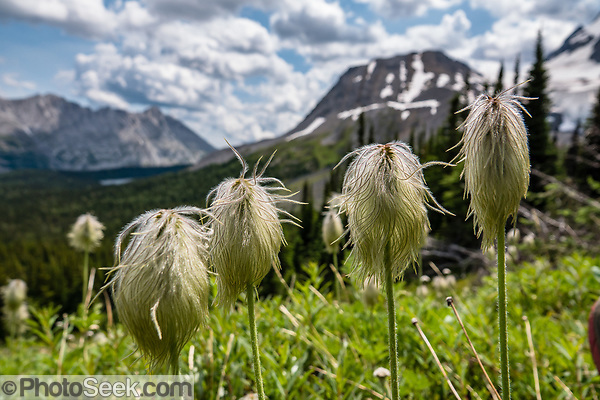 The pass revealed fields of seed heads of Western pasqueflower (Anemone occidentalis, aka Pulsatilla occidentalis, in family Ranunculaceae), and acres of yellow Indian paintbrush (Castilleja). The next day we hiked to Three Isle Lake (5 miles round trip/1800 ft), then back to the car. In Peter Lougheed Provincial Park, roadside wildlife included a coyote casually crossing the road, plus a black bear. The huge Canadian Rocky Mountain Parks World Heritage Site was declared by UNESCO in 1984. Click “i” to display informative captions. Add any of the above images to your Cart for purchase using my Portfolio site. Three gloriously sunny days with no wind made for perfect backpacking to Garibaldi Lake! Garibaldi Provincial Park is east of the Sea to Sky Highway (Route 99) between Squamish and Whistler in the Coast Range, British Columbia, Canada. A hiking loop to Garibaldi Lake via Taylor Meadows Campground is 11 miles (18k) round trip, with 3010 ft (850m) gain. The top of Panorama Ridge is 17 miles round trip with 5100 feet gain from Rubble Creek parking lot (or 6 miles/10k RT with 2066 ft/630m gain from either Taylor Meadows or Garibaldi Lake Backcountry Campground). The vibrant turquoise color of Garibaldi Lake comes from glacial flour suspended in melt water from Sphinx and Sentinel Glaciers. The volcanic pinnacle of Black Tusk (2319 m or 7608 ft) rises above Mimulus Lake, Black Tusk Lake, and Helm Lake, best seen from Panorama Ridge Trail. The Black Tusk is a remnant of an extinct andesitic stratovolcano which formed 1.3-1.1 million years ago: after long glacial erosion, renewed volcanism 170,000 years ago made the lava flow and dome forming the tooth-shaped summit. Global warming/climate change: The Helm Glacier had an area of 4.3 square kilometers in 1928, but declined by 78% to 0.92 square kilometers as of 2009. The Helm Glacier’s melting trend mirrors that of all glaciers in the Pacific Northwest and fits into the pattern of glacier retreat across Canada (measured in the Canadian Glacier Retreat Index). From the early 1700s to 2005, half (51%) of the glacial ice cover of Garibaldi Provincial Park melted away (reference: Koch et al. 2008, web.unbc.ca). The record of glacier ﬂuctuations in Garibaldi Park is similar to that in southern Europe, South America, and New Zealand throughout the last century (the 1900s), suggesting a common, global climatic cause. Clouds and rain stopped us from a 20th anniversary hike to Berg Lake in Mount Robson Provincial Park, so we continued on to Jasper NP. Snow-dusted peaks rose above fall colors at Medicine Lake in beautiful Maligne Valley, Jasper National Park, Canadian Rockies, Alberta. 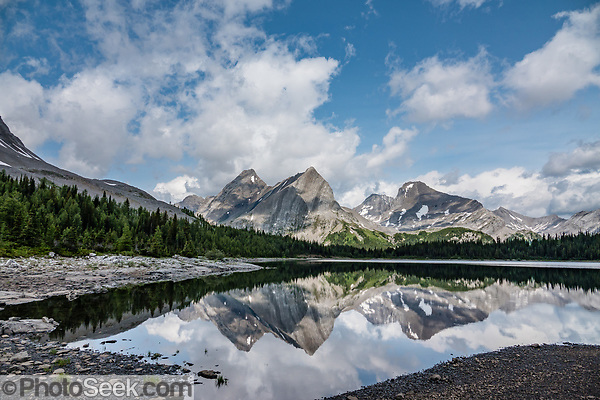 Medicine Lake is not really a lake but is a natural back up in the Maligne River that suddenly disappears underground. Jasper is the largest national park in the Canadian Rocky Mountain Parks World Heritage Site declared by UNESCO in 1984. Viewpoints at Upper and Lower Sunwapta Falls are worth seeing in Jasper National Park – a good rainy-day activity. The falling water originates from the Athabasca Glacier. Snow magically dusted Mt. Chephren (3307 m or 10,850 ft) which soared majestically above orange and yellow fall colors in Mistaya River Valley along the Icefields Parkway, in Banff National Park, Alberta. In Peter Lougheed Provincial Park, Chester Lake is a delightful hike of 5.2 miles round trip with 1000 ft gain through larch forest. Larches are deciduous conifers (with needles turning yellow-orange and dropping in autumn) in the genus Larix, in the family Pinaceae. Extending the hike to Three Lakes Valley is up to 7.8 miles RT with 1800 ft gain to a lake-dotted limestone barrens. Kananaskis Country is a park system in the Canadian Rockies west of Calgary, in Alberta. I grabbed quick photos of a grizzly bear, a cute pica, and a ptarmigan. Sunrise nicely highlighted Mount Kidd which reflected in Kananaskis River near Mount Kidd Interpretive Trail (at convenient Mount Kidd RV Park). Kananaskis Country equals the majesty of neighboring Banff National Park with less crowding. Hike along beautiful Galatea Creek to Lillian Lake (7.5 miles round trip with 1614 gain) or on to Galatea Lakes (10 miles RT with 2214 ft gain as we did) in Spray Valley Provincial Park, from H40 south of Kananaskis Village. Wind whipped water waves created rainbows at Waterton Lake in Waterton Lakes National Park, Alberta. In 1932, Waterton-Glacier International Peace Park joined Glacier National Park in Montana with Waterton. UNESCO honored Waterton-Glacier as a World Heritage Site (1995) containing two Biosphere Reserves (1976). View Tom Dempsey’s photos from an RV trip seeking peak fall colors across Northeast USA up to the dynamic Bay of Fundy in Canada, for three weeks in October 2014. At bottom is my recommended camping itinerary for chasing a month of bright autumn leaf colors through scenic Northeast parks in New York, New England, Pennsylvania, and New Brunswick, Canada. Add any of the above images to your Cart for purchase using my Portfolio site. Or click here to view a more extensive day-by-day gallery from this trip. 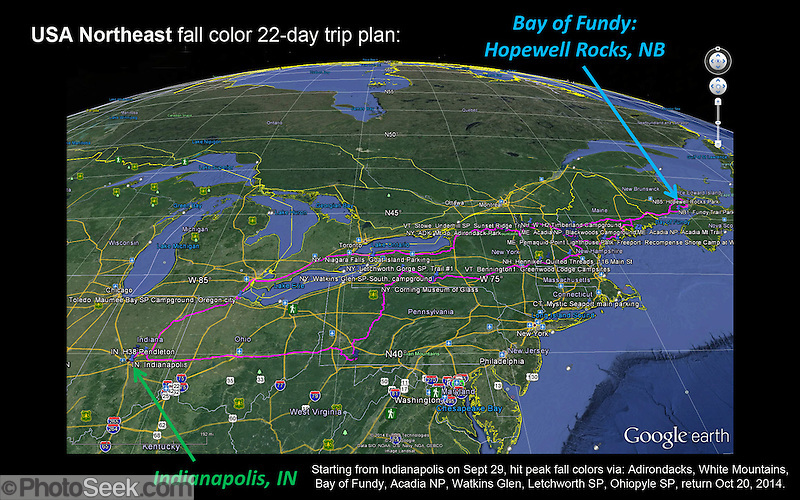 Our camping itinerary let us chase and hit the peak of fall colors at each destination from September 29 to October 20. This photo gallery includes: New York (Niagara Falls/Ontario, Adirondacks, Watkins Glen and Letchworth SP Gorges, and Corning Museum of Glass); Vermont (Mt. Philo SP, Smugglers Notch and Shelburne Museum); New Hampshire (White Mountains, Mount Washington); Maine (Acadia National Park, Pemaquid Lighthouse, DeLorme’s Eartha globe); Pennsylvania (Ohiopyle SP); New Brunswick, CANADA (Bay of Fundy, Hopewell Rocks sunrise, St Martins and Fundy Trail Parkway); and Indiana (Indianapolis Zoo). Colors reach peak first in the Lake Placid / High Peaks area in late September. Most of Adirondack Park is blazing with color by the first week of October. The Lake Placid region has good mountain scenery with alpine lakes and brooks making perfect fall color reflection photos. Drive up ** Whiteface Mountain for easiest high viewpoint (or hike a fire lookout). The latest Adirondacks color peaks along Lake Champlain & Lake George in mid to late October. Fall colors brighten the forests of New York’s Finger Lakes region in the last three weeks of October. In Letchworth State Park, renowned as the “Grand Canyon of the East,” the Genesee River roars northeast through a gorge over three major waterfalls between cliffs as high as 550 feet, surrounded by diverse forests. See rainbows, mist, and picturesque waterfalls up to 107 feet high. Off Interstate 390, 45 minutes south of Rochester. ITINERARY KEY: ***Impressive/Must see. **High priority. *Do it if time allows. Abbreviations: CANADA: ON=Ontario; NB=New Brunswick. RT=round trip. SP=State Park. USA: NY=New York; VT=Vermont; NH=New Hampshire; ME=Maine; PA=Pennsylvania. Rent an RV or car. CruiseAmerica.com has afternoon pick-up 1-4pm in Noblesville, Indiana or various other locations in Northeast USA. Gas expenses for a 25-foot RV add up quickly to around $50/day on this 3847-mile itinerary in 2014. OHIO: Toledo: * Maumee Bay SP Campground (5 hrs from Noblesville RV). Many sites available. ONTARIO: ** KOA Campground, Niagara Falls, Ontario. NY: ADK: *** Fish Creek Pond Campground, near Saranac Lake. Oct 3 camp: VT: Stowe: ** Smugglers Notch SP Campground (1 hr from Shelburne). VT: ** Stowe Pinnacle Trail, Green Mountains (hike 2.8 miles, allow 3 hrs). NH: Lincoln: H112 / *** Kancamagus Hwy. White MountainsVisitor Center. NH: H112: *** Sabbaday Falls, Kancamagus Hwy. NH: H112: ** hike UNH Loop Trail (4.8 miles circuit, 1600 feet gain) on Hedgehog Mountain, Sandwich Range Wilderness, White Mountain National Forest. * Scenic driving route: NH H302 to H112: Bear Notch /Albany Rd midway to Bartlett. NH: White Mountains: walk to ** Diana’s Baths with hiking extension to ** Moat Mountain hike, North Conway (hike 1-10 mi/2800 ft). NH: White Mountains: * Mt Washington Road Tour, H16 (RESERVE AHEAD). or NH: White Mountains: Timberland Campground on US2 NW. Oct 8: NB: * Fundy Trail Parkway is a pleasant side trip adding 1.4 hours. See * Fuller Falls. Oct 9 camp option: NB: ST Martins: Sea Side Tent & Trailer Park (CALL AHEAD: CLOSED early in fall 2014), adjacent to Fundy Trail Parkway. ME: *** Trenton Bridge Lobster Pound serves delicious lobsters boiled in fresh seawater over a wood fire, plus other seafood. 1237 Bar Harbor Rd. or Bradbury Mountain SP Campground. Oct 13: VT: Bennington: * Greenwood Lodge Campsites. VT: Bennington: Silk Road Covered Bridge + Paper Mill CB + Burt Henry Covered Bridge. NY: Ithaca: Buttermilk Falls * Upper hike (Camp option). NY: *** Corning Museum of Glass. Oct 16: NY: ** Letchworth State Park Campground: wander the ***Gorge Trail #1 including Inspiration Point, Middle and Upper Genesee Falls (1-4 miles or drive and park). The huge campground has lots of space in October. Oct 19: OHIO: east of Columbus: KOA-Buckeye Lake Campground (on I-70, 3.5 hours from Ohiopyle). DAY 22 of 22: Oct 20: Indianapolis, Indiana: return RV before 11:00am to Noblesville’s CruiseAmerica RV. Search the latest New England guidebooks on Amazon.com (then buying anything there supports my site). Historical tip: As a Westerner traveling “back East” I learned that New York is NOT part of New England. New York and its Harbor were originally settled by the Dutch, who named it New Amsterdam in the colony of New Netherland. The British renamed the New Netherland colony to New York in 1664 (in honor of the then Duke of York, later James II of England) after English forces seized control of the Dutch colony. Staying in a downtown condo or hotel makes for convenient walking exploration of Vancouver Convention Centre, Vancouver Harbour, Stanley Park, and Vancouver Aquarium. AirBnB [your signup supports my work] helped us locate private condo lodging along Coal Harbor. Stanley Park is a great place for walking, skating, or bicycling. Vancouver Aquarium is excellent, including live shows of Pacific white-sided dolphins and beluga whales. Bloedel Conservatory (4600 Cambie St.) is a domed lush paradise where you can experience the colors and scents of the tropics year-round, within Queen Elizabeth Park, atop the City of Vancouver’s highest point. From Little Mountain (501 feet), see panoramic views over the city crowned by the mountains of the North Shore. A former rock quarry has been converted into beautiful Queen Elizabeth Park with flower gardens, public art, grassy knolls. In Bloedel Conservatory, more than 200 free-flying exotic birds, 500 exotic plants and flowers thrive within a temperature-controlled environment. A donation from Prentice Bloedel built the domed structure, which was dedicated in 1969 “to a better appreciation and understanding of the world of plants,” and is jointly operated by Vancouver Park Board and VanDusen Botanical Garden Association. Fans of astronomy will enjoy H.R. MacMillan Space Centre in Vanier Park, at 1100 Chestnut St, Vancouver, BC. It was founded 1968 and named for a British Columbia industrialist and philanthropist. See worthwhile science exhibits and shows in the GroundStation Canada Theatre, Cosmic Courtyard, and cool Planetarium Star Theatre. The building was designed in the 1960s by architect Gerald Hamilton to house what was then called The Centennial Museum. The Space Centre shares the building with the Museum of Vancouver. Outside, the Crab fountain sculpture was made in 1968 by George Norris. In First Nation legend, the crab is the guardian of the harbour and was also the zodiac sign at the time of the Canadian Centennial in 1967. Admire waterfalls in Lynn Canyon from the Suspension Bridge continue on a pleasant walking loop of several kilometers through wild rainforest. Lynn Canyon is a municipal park established in 1912 at 3663 Park Road, in North Vancouver, British Columbia, V7J 3G3, Canada. Phone 604-990-3755. The Resort Municipality of Whistler is not only one of the most scenic ski areas in North America, but also hosts great summer hiking and mountain biking. Whistler has become a thriving center for year-round outdoor sports in the Coast Range of British Columbia, Canada. Hiking at Whistler is well worth the 10 hours round trip drive from Seattle, if you stay for a minimum of 3 nights — but allow extra traffic time for the slow border crossing between Canada and USA. (Read more about expedited entry / US Immigration.) Stay in a condominium or campground and hike the scenic trails featured below. The official visitors’ web site www.whistlerblackcomb.com helpfully books lodging and provides hiking, mountain biking, and skiing maps. Nearby Garibaldi Lake is one of my favorite wilderness trips (day hike or backpack). The Peak 2 Peak Gondola connects Whistler Village Gondola with Solar Coaster Express on Blackcomb Mountain for sightseeing or skiing variety. Buy a season pass if using lifts more than 2 days. Built in 2008, Peak 2 Peak Gondola holds world records for the longest free span between ropeway towers (3.03 kilometers or 1.88 miles) and highest point above the ground (436 meters or 1430 feet). On Whistler Mountain, hike the High Note Trail to views of turquoise Cheakamus Lake in Garibaldi Provincial Park and onward to Harmony Lake, back to Whistler Village Gondola at Roundhouse Lodge (6 miles or 10k, with 2200 feet descent and 1000 feet ascent). Start the walk with a ride to the top of Whistler Peak Express Chairlift, which is a short walk downhill from Roundhouse Lodge. Hike the Overlord Trail on Blackcomb Mountain (2440 meters) for flowers and good views in the Spearhead Range across Fitzsimmons Valley. Starting from the top of Solar Coaster Express Chairlift on Blackcomb Mountain, walk round trip for 1 to 6 miles (2k to 10k), with up to 1700 feet of ascent, ending with a chairlift back down to Whistler Village. Driving 25k south of Whistler, backpack 1 or 2 nights to turquoise Garibaldi Lake, hiking to Panorama Ridge and Black Tusk. Garibaldi Provincial Park is east of the Sea to Sky Highway (Route 99) between Squamish and Whistler in the Coast Range. A hiking loop to Garibaldi Lake via Taylor Meadows Campground is 11 miles (18k) round trip, with 3010 ft (850m) gain. Panorama Ridge is 6 miles (10k) RT with 2066 ft (630m) gain from either Taylor Meadows or Garibaldi Lake Campground (or 17 miles RT with 5100 ft gain from Rubble Creek parking lot). Drive an hour on the main highway northeast from Whistler to Joffre Lakes Provincial Park, BC. A rough, rocky, steep hike of 10 kilometers round trip ascends (400 meters up) by a rushing stream to three beautiful turquoise lakes. The Lower, Middle, and Upper Joffre Lakes are colored by glacial silt which reflects green and blue sunlight. The road onwards to Lilloet is very scenic. As of 2005, Overlord Glacier had retreated 880 meters from its terminus of year 1929. From the early 1700s to 2005, half (51%) of the glacial ice cover of Garibaldi Provincial Park melted away (Koch et al. 2008, web.unbc.ca). The record of 1900s glacial fluctuations in Garibaldi Park is similar to that in southern Europe, South America, and New Zealand, suggesting a common, global climatic cause. Read more about global warming/climate change. Search for latest “Canada Rockies travel books” at Amazon.com. Search for latest “Montana travel books” at Amazon.com. Glacier-Waterton International Peace Park (2003 Mountaineers Books) by Vicky Spring. The ultimate trail guide to one of the most beautiful hiking places in the world. A true story from Bowron Lake Provincial Park, British Columbia, Canada. September 18-28, 1993. Adventure travel sometimes takes an unexpected turn. While backpacking in Canada, I heard tales of a wonderful 73-mile canoe trip where you paddle a rectangular circuit of wilderness lakes and portage by rolling your canoe on wheels. Rugged mountains soar a vertical mile above you, mysterious mists hug the waters, and ravaging bears take your gear unless it is hung in caches reached by ladder. After dreaming about the trip for two years, I borrowed a canoe and joined some friends at Bowron Lake Provincial Park, near Quesnel, British Columbia. Little did I know that we would encounter an animal more fearsome than any bear. On the first day of the trip we witnessed a marriage proposal, a case of hypothermia, and a trip member running to catch his own ambulance! I planned to spend seven days canoeing the Bowron circuit with Mark and Kim, a married couple whom I knew through work. Kim’s friend Laura from the East Coast decided to join us. We chose to go in late September, when the summer crowds diminish and the leaves of the aspen trees glow gold. A week before the trip, my phone rang. On the line was Dale, a stranger to me, calling from Oregon. (I’ve changed the name of Dale for this story, but all other details are true.) Laura was going to visit Dale for three days on her way to meet us in British Columbia. With enthusiasm, he asked if he could join our canoe trip, which would be a great break from his stressful high-tech job. I chatted in a friendly manner, then questioned Dale closely about his outdoor experience. The Bowron canoe circuit requires paddling and camping in remote wilderness areas, a few days away from help. Dale said he was an experienced river rafter, triathlon athlete, and mountaineer. He had led climbs of several high mountains. Although he sounded a little manic and excitable, I felt that he might add positive energy to our group. When he asked if Laura was my “blind date,” I said no, and he seemed relieved. Laura had never been his girlfriend, but he seemed interested in renewing a friendship with her. We spoke at length. Because I had initiated the trip, I had some power over who would go. Finally, I agreed that he could join us on our dream trip. Mark, Kim, and I drove two cars from Seattle to the airport in Quesnel, British Columbia, which was just an hour’s drive from Bowron Lake. Dale and Laura arrived by plane. As she entered the baggage claim area, Laura was a little tired but in good spirits. Laura went in the car with Mark and Kim. Dale rode in my car. His eyes showed exhaustion, yet he pushed himself to stay awake. Last week on the phone he had spoken energetically, but now his voice was flat and devoid of emotion. I felt tense in this presence. “Do you own a car?” I asked. Yes, that was what he meant. Something disturbs me about his flat, robot-like voice, I thought. Despite his apparent exhaustion, Dale spoke with logic and intelligence. With more energy, he asked me if I wanted to climb a high mountain with him at some point during the trip. I said yes. He described his leadership experience, then questioned my abilities as trip leader. I said that I led informally by consensus and honored the opinions of those with the most experience. “Would you be willing to risk your life to save someone else’s life?” Dale pressed. My headlights pierced the pitch black night. I followed Mark and Kim’s red taillights as we drove the winding gravel road to Bowron Lake. Suddenly, the road forked ambiguously. Mark and Kim stopped their car and stepped out with Laura. Dale and I joined them. “This guy is crazy!” I blurted, half-jokingly, towards Dale. Dale’s robot-like behavior was giving me the creeps. Dale didn’t react. To break the ice, we joked about being lost in the wilderness with Dale as an ax murderer. Dale cracked a small smile. Only Laura knew Dale, but she offered no unusual insights about the past three days she had spent with him in Oregon. Until this week, she hadn’t seen Dale in four years. We chose the correct road and drove to our lakefront lodge to get some sleep. All five of us shared one cabin. Wow, I thought, Dale has seriously disassociated himself from his feelings. I did not trust his ability to cooperate with the group. I lost several hours of sleep worrying about how I would handle seven days in the wilderness with Dale. Finally, I decided that stress and lack of sleep explained Dale’s unusual behavior. He would probably awake with the normal personality that I knew from our telephone conversation. As I undressed to take my shower in the morning, I heard a knock at the bathroom door. I wrapped a towel around my waist and opened the door. Dale addressed me on his knees. “May I please have Laura’s hand in marriage?” Dale asked seriously. Maybe Dale normally spoke in this style of deadpan humor. Only Laura knew Dale’s personality. I trusted her to tell us if Dale was unfit for canoeing 70 miles in the wilderness. Mark told me later that Dale had rustled loudly through several packs in the wee hours of the morning as others slept. Dale had apparently eaten an apple and then planted its seeds outdoors in the frosty ground. Mark found this behavior rather strange, because apple seeds would never germinate in this cold climate. I agreed. But then I silently forgave Dale, because for him, planting seeds in the wilderness might be symbolic, like placing flowers on a grave. Rays of sun pierced the morning fog and illuminated the golden aspen trees, which reflected in the expanse of beautiful Bowron Lake. As we ordered breakfast at the lodge, Dale asked the waitress, “Do you need any help in the kitchen?” The waitress looked at him quizzically. She silently shook her head and returned to the kitchen. With mingled fear and excitement, our group discussed the coming trip. When Dale asked if anyone knew water life-saving skills, I said yes. I said that if anyone fell into the water of these lakes, within five minutes they would lose most of their strength. This happened to me in a limb-numbing practice swim from a raft in Grand Canyon National Park, Arizona. The Glen Canyon Dam releases the Colorado River into the Grand Canyon at 46 degrees Fahrenheit, which is very cold. The lakes of Bowron Lake Provincial Park are even colder. Not surprisingly, hypothermia poses the greatest danger on the Bowron circuit. We agreed to keep within voice distance at all times during the trip. We repacked gear for the canoe trip. “Is that your pack?” I asked Dale, pointing to his pack. “That’s not my pack. That’s a pack” he corrected. This smart-aleck behavior could get out of hand, I thought. I felt oddly fearful. The lodge’s van carried our boats and gear to the trail head. Sun filtered through the aspen trees and warmed the air pleasantly. We strapped our canoes onto rented carts for wheeling a mile to the first lake of the Bowron circuit. However, Dale seemed confused. He kept trying to wheel his single-man canoe to the lake visible below instead of up the trail. We had to redirect him twice. Once he found the right trail, Dale ran far ahead, contrary to our agreement to stay within shouting distance. We arrived at the crystal-clear, inviting lake outlet, which twisted through a reedy marsh surrounded by pine trees. The sun forced steam from the still surface of the outlet channel. But we saw no trace of Dale or his canoe. I confided to Mark, “This is really getting out of hand.” Despite the beautiful surroundings, my mood soured from distrust of Dale’s behavior. A canoe approached around a small bend. A concerned woman in the canoe said, “Just around the corner, your friend is naked and neck-deep in water. His wet clothes are in the boat. He says he’s meditating, but he acts a little strangely. What should we do?”. “We’ll be right there,” said Mark, as we hastened to detach the wheeled carts from our canoes. A few minutes later, the woman returned by canoe and said, “Your friend has stopped shivering and no longer replies. We’re getting very concerned for him.” By then, Mark and Kim were paddling madly around the corner. By this time, Dale may have been in the icy cold water for 25 minutes. As Mark and Kim approached him, Dale instinctively reached out of the water and grabbed their canoe, almost capsizing them. His bluish body clung to their canoe as they paddled to shore. They helped the tall, now-shivering Dale to shore, and Kim wrapped him with a silver space blanket. Laura (clothed) joined Dale in a sleeping bag to help warm him. I heated some hot water on a stove to help revive him. Mark and I privately shared anger at Dale’s irresponsible behavior. Kim ran back to the ranger station and ordered an ambulance, as suggested by Mark. After an hour, we were able to revive Dale from the depths of hypothermia. He finally stopped shivering. Eventually he crawled out of the sleeping bag shared with Laura. “Here, Dale, put on another coat,” said Kim. “No, Dale, no one drowned here today,” I said. Although still suffering from hypothermia and shock, he had now returned to his robot-like personality. He followed our instructions and allowed us to paddle him back to the start. We felt fortunate that Dale had not chosen to pull this stunt in the middle of the trip, days away from help. As a confident swimmer and triathlete, perhaps he didn’t really believe my saying that in these lakes, hypothermia can hit you after only five minutes of immersion. Dale’s eyes darted furtively. Suddenly he sprinted down the trail. I shouted, “Wait Dale, we’ll first need your life jacket back.” My voice stopped him in his tracks, and he obediently returned the life jacket. To prevent him from retreating further into himself, I engaged him to help put his one-man canoe on wheels for return to the lodge. Laura’s return flight restricted us to finish the Bowron circuit by a certain date. Unfortunately, Dale’s flirtation with hypothermia cost us a day. Our group, minus Dale, athletically paddled the loop for six days, instead of the seven days originally planned. For greater enjoyment, I recommend taking eight or more days. Luckily, a tailwind pushed us most of the trip. Canoeing the Bowron loop turned out to be safer than I had expected. We shared our wilderness experience with about six other canoes per day. Rangers in powerboats patrolled each lake about once a day. A ranger had taken less than half a day to travel 30 miles around the lake system on foot and by powerboat to help us with Dale. However, by then we had already sent Dale away in the ambulance. I thanked the ranger for his valiant efforts. “I’ve seen a number of disassociated people like Dale come to this park in the past,” he said. We paddled fifteen long miles across “L”-shaped Isaac Lake. I paddled the “J”-stroke thousands of times to propel the canoe straight. Once or twice a day we reshuffled gear and mounted the canoes onto handy bicycle-wheeled carts for overland portaging. We wheeled the canoes for only 5 miles of the 73-mile circuit. As darkness fell each evening, we had just enough time to set up tents and cook a tasty dinner before admiring the starry sky. As a nightly ritual, we climbed high ladders to pile our food in bear-proof caches provided in the designated campgrounds. We shot the whitewater chute of Isaac River, and successfully negotiated the snags of Cariboo River. Fresh snow dusted the Needle Point Ridge a mile above Lanezi Lake. A small glacier clung to a mountain in the distance. In the middle of shallow Sandy Lake, we appeared to walk on water as we pulled our canoes to deeper channels. On the West side of the 70-mile loop, Spectacle Lakes reflected spectacular rows of golden aspen trees. Gradually the mountains receded into the distance, the warm sun shone, and lakes became calm as mirrors. A few days after our harrowing start, I began to relax. On the last day, in the final stretch back to the lodge, rain fell gently as we paddled across Bowron Lake. For campfire entertainment during the trip, I enjoyed quoting from Dale: “Are you going to plant seeds? . . . A man drowned here today. . . . I’m reborn. . . . All I need is a compass and a wife.” I must credit Dale for enlivening my vacation memories. Perhaps he got all that he wanted out of his trip: a compass strung around his neck for a sense of direction, and a warm woman in his sleeping bag to help revive him. Along with Dale, I felt reborn in the wonderful wilderness waters of Bowron Lake Provincial Park. Copyright 1993 by Tom Dempsey. Search for latest “Canada Rockies travel books” at Amazon.com. Search for latest “Montana travel books” at Amazon.com. 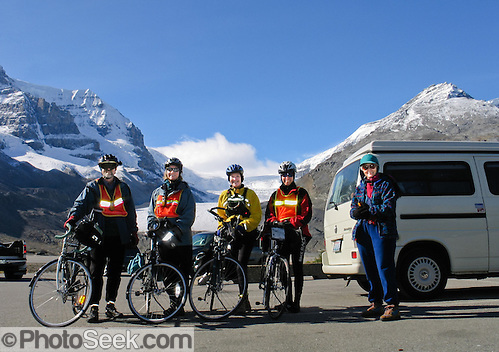 In one of our most memorable trips, we bicycled from Jasper to Banff in the Canadian Rocky Mountains, camping with support vehicles (September 9-14, 2003). Complete planning details are shared below. Our four riders ages 45 to 66 were supported by Mom and Dad (in their 70s) driving two Volkswagon Eurovan Campers as sag wagons. Spreading the 187-mile bike tour over 5 days plus a rest day let us appreciate the great scenery with moderate effort. Our first day of biking finished in style with a relaxing soak in Miette Hot Springs, a favorite swimming pool with mountain views. In comparison, Banff Hot Springs has a great view but is more crowded and disappointingly lukewarm. Self-organizing the bicycle tour saved money and allowed flexibility to ride on rain-free days. Rainy forecast for the first 2 days in Banff motivated a rainy car shuttle drive north to sunnier Jasper. We rode bikes two days, rested on a rainy day, then rode three more days, averaging 38 miles per riding day. Rain showers dampened half of one riding day. Total elevation gain over 5 days from Jasper to Banff was 6800 feet, with 5600 feet downhill. The order of two trip legs were switched, bypassing snow falling at Sunwapta Pass (Leg 3) in favor of no precipitation at Bow Pass (Leg 4). This leg swap let us ride glorious Sunwapta Pass (Leg 3) on a beautiful sunny day speeding 2200 feet downhill over 43 miles (plus 1300 feet up). Good training made the hardest day (Leg 2) seem normal, climbing 2400 feet over 35 miles. Dress warmly in moisture-wicking layers with waterproof breathable rain jacket. Use rain-proof booties, or cheap plastic bags between socks and shoes, in case of wind chill or rainy days. Cell phones may have no coverage in the middle 100 miles of the ride. Use walkie-talkies (with at least 5+ mile range) for communication between spread-out cyclists and support vehicles. The radios improved morale and prevented logistics problems, such as when a car key was misplaced, then replaced, with the help of radio communication. We bicycled 187 miles from Jasper to Banff, from campsite to campsite, September 9-14, 2003. From: Whistlers Campground (hot showers, Dump Station, open through 10/13/03, 3500 feet elev) (2 miles from town of Jasper). To: Honeymoon Lake Campground (no showers; open until 10/13/03; 4300 feet elev). To: Columbia Icefield Campground (or adjacent Wilcox Creek Campground, DS, no showers; open through 9/22/03; 6600 feet elevation). We added a rest/rain day after the first two days of riding. To: Waterfowl Lakes Campground (no showers, open through 9/28/03). My favorite day, a speedy descent on a sunny day through gorgeous river and mountain scenery. Bow Pass, 6785 feet, is the highest elevation on the Icefields Parkway. The steepest ascent on Bow Pass climbs 800 feet in 3.5 miles, not too bad. A side trip to Peyto Lake viewpoint is highly recommended. To: Lake Louise Campground (5100 ft, hot showers, DS) Carol’s favorite day, a moderate climb followed by a fun, long 2000-foot descent to Lake Louise. We completed our bicycle ride just in time (September 14, 2003), because snow fell that night and days after! 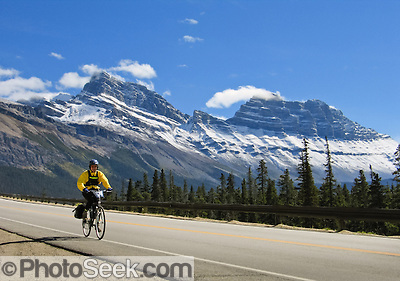 Bicyclists commonly ride the Icefields Parkway in either direction. The southward road climbs 6800 feet total, with 5600 feet downhill. Although the net uphill is 1200 feet, you avoid climbing the long, narrow-shouldered, steep hill northwards up to Sunwapta Pass. If you reverse the above five-day route, pedaling from Banff to Jasper makes nice moderate rides between the same campgrounds and climbs less, with only 5600 feet total gain and 6800 feet total down. Optionally shorten the trip to four days by combining Legs 1 and 2 into one day of 67 miles climbing 500 feet and descending an exhilarating 3700 feet. www.cedarsrvpark.com: Campground with hot tub and pool, 1-877-836-3988, Sicamous, BC is 400 miles from Seattle. Banff NP: Lake Louise Tent Campground and separate Trailer Campground, and Banff Tunnel Mountain #1 and #2. Each morning, our support vehicles drove ahead to secure our next campsite without reservations and had no problem getting a site between 9:00am and noon in September 2003. Banff NP: Banff Tunnel Mountain Village (plus Banff Upper Hot Springs nearby), Two Jack Lakeside, Johnston Canyon, Lake Louise. Jasper NP: The Whistlers Campground (closes mid October), Wapiti Campground (closes in early September), and Miette Hot Springs (day use). The campgrounds from Waterfowl Lakes through Honeymoon Lake have no hot showers. Alternatives: sponge baths, or drive to showers or hot springs. RV Dump Stations (DS): In Banff NP: Tunnel Mountain, Johnston Canyon, Lake Louise, & Waterfowl Lakes campgrounds. In Jasper NP: Wilcox Creek, Whistlers, Wapiti Campground. Food: buy groceries in Banff, Castle Junction, Lake Louise (more expensive), Saskatchewan Crossing (small grocery & restaurant), or Jasper. Our bikers carried their snacks, water and lunch each day. Restaurants are available at Vermilion Crossing and Sunwapta Falls. Miette Hot Springs: Soak in the hottest springs in the Rockies, a clean swimming pool with a good view of Ashlar Ridge. Drive 1 hour from Jasper. 8:30 am – 10:30 pm summer hours. The Whistlers Tramway whisks you up to high views of the Victoria Cross and Colin Ranges rising across the broad Athabaska River Valley. Lower Maligne Canyon: Walk above a scenic slot canyon and gorge. Mount Edith Cavell: Hike 2-5 miles to see spectacular Angel Glacier and Cavell Pond. Sunwapta and Athabasca Falls: Easy stroll. Columbia Icefield Visitors Centre: SnoCoach ride ~$30 on Columbia Icefield. Wilcox Pass: 5 miles round trip, 1082 feet gain (7,790 feet max elevation). Start at Wilcox Creek Campround, 1.2 miles east of Icefield Centre. Parker’s Ridge (7200ft elev; marked trailhead in Banff NP, 5 miles south of Icefield Centre): Walk 3 miles round trip, 910 ft gain, great view of Saskatchewan Glacier. Join the crowds at Fairmont Chateau admiring Lake Louise, Mount Victoria, and Mount Temple. Moraine Lake is a hilly side trip on a narrow road with high traffic. Park early to avoid crowds and filled lot. Cross the outlet stream and ascend the little hill trail for a stunning view across the turquoise lake reflecting the Valley of the Ten Peaks. Johnston Canyon: Start early in the morning (or off season) to get ahead of busloads of hikers on this deservedly popular trail. Easily walk 1 to 7 miles, 300-800 feet gain, through an attractive gorge with waterfalls. Only walk further to the Ink Pots if you want more exercise. Herbert Lake and Bow Lake reflect peaks spectacularly on a windless day. Peyto Lake overlook: Walk a short distance to see a spectacular turquoise lake and Bow Pass. Read the longer article: CANADA: Canadian Rockies & Columbia Mountains parks, which covers hiking in more detail. Geology of British Columbia: A Journey Through Time (2011) by CanningsMoraine Lake, near : Cross the outlet stream and ascend the little hill trail for a stunning view across the turqoise lake reflecting the Valley of the Ten Peaks. Park early to avoid crowds and filled lot. The Rocky Mountain Trench geologically splits off the Columbia Mountains to the west of the Rockies, in BC, Canada. Add any of the above images to your Cart for purchase using my Portfolio site. See wild animal photos in their natural home: wapiti (elk), osprey, Mountain goat (Oreamnos americanus), Rocky Mountain Bighorn Sheep (Ovis canadensis canadensis), black bear, grizzly bear, Columbian Ground Squirrel (Spermophilus columbianus), and Golden Mantled Ground Squirrel. Enjoy these wonderful Canadian parks by camper, bicycle, feet, and canoe. Hike over Cory Pass on the Mount Edith loop trail (best walked clockwise, 8 miles) with impressive views of the spire of Mount Louis. The trail is sometimes rough and steep, but scenically rewarding. Beware of steep snow patches and don’t hike in inclement weather. We hiked snow-free on August 29, 2009. Drive Bow Valley Parkway (Highway 1A), a slower scenic route which parallels main Highway 1 between Lake Louise and Banff. Johnston Canyon hike: Start early in the morning (or off season) to get ahead of busloads of hikers on this deservedly popular trail. Easily walk 1 to 7 miles, 300-800 feet gain, through an attractive gorge with waterfalls. Only walk further to the Ink Pots if you want more exercise. Backpack to scenic Egypt Lake (with optional hut) starting from Sunshine Village (via bus) and/or its parking lot. West of Castle Junction, the scenic Boom Lake trail features the mother lode of lichen polygon patterns, a holy grail for this nature travel photographer. 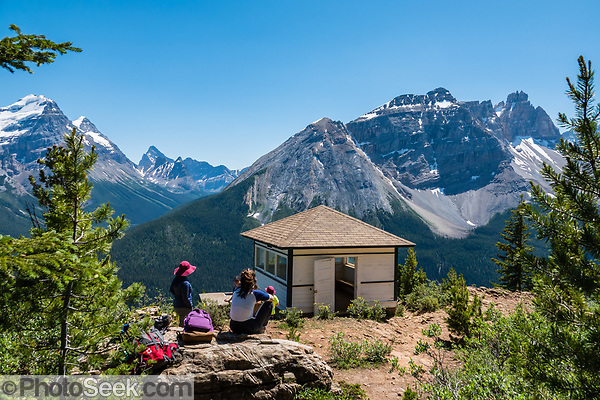 Beehive loop hike: Start early in the morning, and expect crowds of walkers on this very scenic hike from Lake Louise to Plain of Six Glaciers Teahouse, looping back via the Beehive and Lake Agnes Teahouse. Atop the Big Beehive, admire turquoise Lake Louise and Fairmont Chateau where you started far below. Saddleback-Mt Fairview: hike steeply through larch forest 4.6-6.4 miles RT / 1970-3310 feet gain. Whether or not you walk to the pleasant Consolation Lakes, don’t miss the short side trail up a little hill for the stunning overview of beautiful blue-green Moraine Lake, just across the outlet stream! Wenkchemna Pass & Eiffel Lakes: hike 11.7 miles RT, 2362 feet gain for golden larches in mid September. Moraine Lake Road closes around Oct 13 or earlier due to snow. See classic Rocky Mountains reflected in Herbert Lake. Bow Lake reflects Crowfoot Mountain. Great viewpoints overlook blue-green Peyto Lake and Bow Pass. Mount Athabasca and other peaks rise impressively above the road. Parker’s Ridge: Hike 4.8k round trip to overlook impressive Saskatchewan Glacier. Hot Showers in Banff NP: Lake Louise Campground, Johnston Canyon Campground, Banff Tunnel Mountain Village Campgrounds 1 and 2 (plus Banff Upper Hot Springs nearby), and Two Jack Lakeside Campground. Food: Get groceries in Banff and Jasper. Food is more expensive at Saskatchewan Crossing (small grocery & restaurant), Castle Junction, and Lake Louise. Restaurants are at Vermilion Crossing in Banff and Sunwapta Falls in Jasper. RV dump stations: Tunnel Mountain, Johnston Canyon, Lake Louise, and Waterfowl Lakes campgrounds. The Whistlers Tramway and hike: to save your knees, hike up 4000 feet and take the Tramway down (or Tramway round trip). 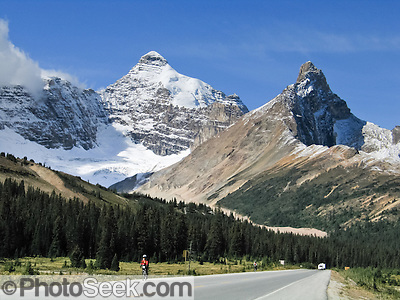 See distant views of Victoria Cross Range, Colin Range, and Mount Edith Cavell. Lower Maligne Canyon: hike above a scenic slot canyon and gorge. Little Shovel Pass day hike 12.5 mi RT / 1600 ft. Or backpack 2-4 days the whole Skyline Trail. Soak in the hottest springs in the Rockies, with a good view of Ashlar Ridge (drive 1 hour from Jasper). On the turn up Miette Road is Pocahontas Campground (reservations accepted) which will save you from driving an hour back to Jasper. Sulphur Skyline: hike 5.5 mi RT/2300 ft (for better, higher views than from nearby Utopia Pass). Athabasca Falls: Athabasca River plunges impressively at this roadside overlook and short walk. Sunwapta Falls: scenic roadside overlook, or walk further to worthwhile Lower Sunwapta Falls. Admire the Athabasca Glacier. 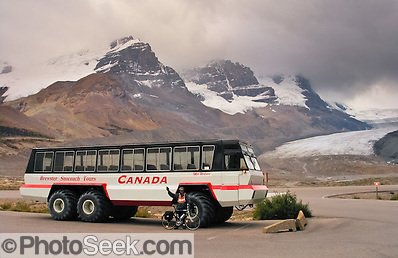 Ride the SnoCoach on Columbia Icefield. Wilcox Pass: Hike 5 miles round trip, 1082 feet gain (7,790 feet max elevation). Start at Wilcox Creek Campground, 1.2 miles east of Icefields Centre. Parker’s Ridge, in Banff NP (7200ft elev): Walk 3 miles round trip, with 910 feet gain, for a great view of Saskatchewan Glacier. Park at marked trailhead, 5 miles south of Icefields Centre. Hot showers in Jasper NP: The Whistlers Campground (closes in mid October), Wapiti Campground (closes in early September), and Miette Hot Springs (day use). RV Dump Stations: Whistlers Campground, Wilcox Creek Campground. Camp at Kicking Horse Campground or adjacent Monarch Campground, in Yoho National Park, BC. Walk around beautiful Emerald Lake at lake level 5.2km. Or hike the breathtaking Emerald Triangle 20 km (12 miles, with 3200 feet gain) round trip over Burgess Pass and Yoho Pass in a day as we did! To visit a fascinating chapter in the history of life, reserve a tour of the geologically important Burgess Shale, a restricted area near Burgess Pass. If you stay at Emerald Lake Lodge, you can rent a canoe on the turquoise waters. Takakkaw Falls to Yoho Lake makes a great half-day circuit of 6.3 miles (10.1km). Iceline Trail is a classic day hike or backpack. Hike turquoise Sherbrooke Lake combined with scenic Paget Peak Lookout (7 miles round trip with 1920 feet gain). Cathedral Mountain and Mount Victoria North Peak rise dramatically above the Kicking Horse Pass area. The town of Field in Yoho NP is 3.5 hours drive from Jasper townsite. Lake O’Hara (6600 ft elevation) is a gorgeous area with many classic hikes from the campground (or lodge), with limited access. No cars or cycling are allowed on the bus road to Lake O’Hara, but walking the road is allowed, and then taking the bus ride back down at 4:30 or 6:30pm is free with no reservations required. In 2001, we enjoyed walking Cataract Brook trail (closed as of 2012?) to Lake O’Hara in 8 miles (1350 feet gain), but now you must walk the road or take the bus. BUS OPTION: Open June 14, 2013 to September 30, 2013 (dates vary by year). Taking the bus to Lake O’Hara starts several gorgeous day hikes of any length. The bus allows one large or two small pieces of baggage per person. Tent sites have tent pads, well water, cooking shelter, pit toilets. Hike Odaray Highline Trail to Odaray Grandview Prospect. A worthwhile short walk is Marble Canyon, which cradles turquoise Tokumm Creek just above its confluence with the Vermilion River. 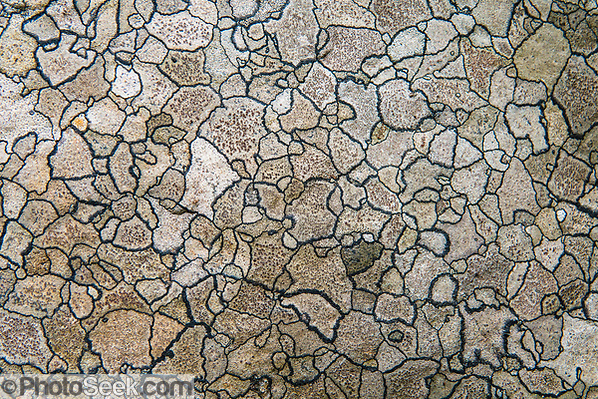 For over 500 million years before tectonic forces thrust up the Rocky Mountains, a shallow tropical sea deposited carbonate sediments that became the limestone and dolomite rock seen here (not marble). Nearby: historically, humans have mined the colorful Paint Pots, natural ochre beds formed by the accumulation of iron oxide around the outlets of three cold mineral springs, worthy of a short walk. The Rockwall‘s east-facing cliffs form the backbone of the Vermilion Range, which stretches nearly 40 kilometers (24 miles), hikeable via athletic loops or traverses. The Rockwall soars 1000 meters (3300 feet) over Floe Lake, an excellent backpacking destination, 10.7 km one way. A great two-night backpacking traverse stays at Numa Creek Campground then Floe Lake Campground. A great 3-night traverse goes from Paint Pots Trailhead to Tumbling Creek Campground (where you can day-hike to Rockwall Pass), then to Numa Creek Campground, then to Floe Lake Campground, then out; or for 4 nights, start this with Helmet Creek Campground. Hitchhiking, bicycling, or car shuttle is possible to retrieve your car from the starting point. Add any of the above images to your Cart for purchase using my Portfolio site. Above photos include Lake Magog, Sunburst Lake, Cerulean Lake, Nub Peak trail, and a Columbian Ground Squirrel. 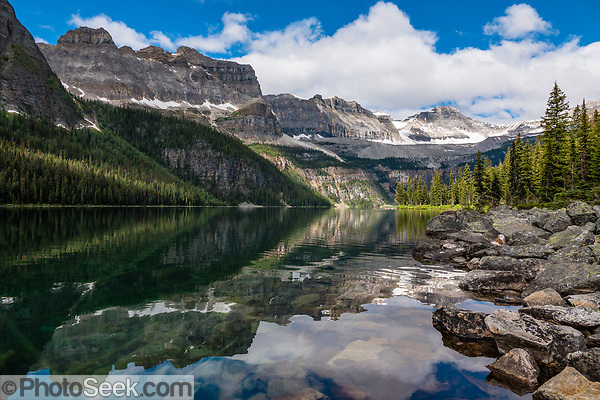 Hike from Banff National Park to Rock Isle Lake via Sunshine Meadows. A helicopter can optionally carry you and/or your backpack to Assiniboine Lodge in the remote wilderness at Lake Magog with great views of Mount Assiniboine (11,871 feet, the “Matterhorn of Canada”). Comfortable private rooms in the Lodge are pricey. A cheaper option is to book your group into the dormitory-style Naiset Huts and use their Wonder Lodge Cooking Shelter for comfortable indoor communal cooking (gas cookers provided) and socializing. Or carry a tent and camping gear about 25 minutes further to Lake Magog Campground. Trailhead: Spray Lakes-Mount Shark Day Use Parking, on gravel road 1 hour (41.3 km) west of Canmore, Alberta (or 1.5 hours drive from Banff, or 3 hours drive from Calgary). For many more hikes nearby, see Kananaskis Country further below. Day 1: hike 7.5 miles, 400 feet up, 300 feet down to Bryant Creek Shelter (6000′). Day 2: hike 6.7 miles, 1100′ up through Assiniboine Pass (7000′) and then to Naiset Cabins at Lake Magog (7100′), below towering Mount Assiniboine. Days 3 and 4: Layover days, for hiking around this beautiful area. Day 5: hike 7.9 miles, 750′ up, 1850′ down, through Wonder Pass (7850′) past huge Marvel Lake to Bryant Creek Shelter (6000′). Day 6: hike 7.5 miles, 300′ up, 400′ down retracing Day 1, back to trailhead. Or use the helicopter: Send your backpack ahead by helicopter and hike the 14.2 miles in one day. We enjoyed this service going out! The optional Citadel Pass route to Mount Assiniboine starts at Sunshine Village (7200’), reached via bus in in Banff NP. Hike 8.7 miles to Porcupine Campground, then 9.5 miles to Assiniboine Lodge Naiset Huts (at 7100′ elevation). The hardest part is a steep descent from Citadel Pass (7740’) to Porcupine Campground (6000’). Getting there: Mount Robson Provincial Park Visitor Centre is 1 hour drive from Jasper town, or 200 miles (4.5 hours drive) from Field in Yoho NP. Robson Meadows Campground: hot showers; 93 sites first-come first-served, 32 sites reservable 2 days to 3 months prior at at www.pccamping.ca or 1.877.737.3783 from 7am-7pm. Robson River Campground: hot showers, 19 sites first-come first-served. Lucerne Campground is located on Yellowhead Lake in British Columbia, 10 km west of Alberta boundary, 32 sites first-come first-served, no showers. Robson Shadows Campground: 5 km west of Mount Robson PP Visitor Centre, panoramic view of Mount Robson, 25 natural campsites on Fraser River, hot showers, group site, phone 250-566-9190, reservations 1.888.566.4821. In 2008, Carol and I fondly revisited Berg Lake, our first international backpacking destination together (1995), plus other parks, with a group of friends. Backpacking to Berg Lake is 22 kilometers (13 miles) one way. All campsites have bear poles, pit toilets, washbasins and grey-water pits. Reserve backcountry sites at 1-877-737-3783, change at 1-800-689-9025, 7am-7pm. Day 1: Hike 6.5 miles, 870 feet up to Whitehorn Campground (3700 feet elev). Day 2: Hike 5.6 miles, 1700 feet up to Berg Lake Campground (5400 feet elev). Day 3: Allow time for the eye-popping dayhike to spectacular Snowbird Pass, one of our world favorites. Day 4: Hike out 13 miles in one day, mostly downhill. Or on Day 4, hike 7.9 miles, 2100 down, to Kinney Lake campground (3300 feet elev). Then on Day 5, hike from Kinney Lake campground to trailhead 4.1 miles, 470 feet down. Add any of the above images to your Cart for purchase using my Portfolio site. Images include: golden larch trees, grizzly bear (brown bear), pica, ptarmigan, Upper Kananaskis Lake, Chester Lake Trail & Three Lakes Valley, Galatea Creek Trail to Lillian Lake & Galatea Lakes, Mount Kidd reflecting in Kananaskis River, Rawson Lake trail, Mari Lake reflections, and Sarrail Creek waterfall. The many parks of Kananaskis Country rival the splendor of neighboring national parks but without the crowds. Kananaskis Country is an improvement district (rural municipal administration) in the front ranges of the Canadian Rockies west of Calgary, in Alberta. Detailed hiking book with maps: Gillean Daffern’s Kananaskis Country Trail Guide – 4th Edition: Volume 1: Kananaskis Valley, Kananaskis Lakes, Elk Lakes, The Smith-Dorrien (2010). Elbow Lake: hike 1.7 mi RT/450 ft gain on a counterclockwise loop around a colorful & popular lake near Highwood Pass. See #47 in Daffern’s Kananaskis Country Trail Guide (2010). King Creek Ridge: hike 4.2 mi RT/2400 ft gain strenuously up to a great viewpoint; from H40 at its junction with Kananaskis Lakes Trail road. See #43 in Daffern’s Kananaskis Country Trail Guide (2010). Lillian Lake-Galatea Lakes in Spray Valley PP: hike 7.5-10 mi RT/1614-2214 ft gain from H40 south of Kananaskis Village. See #30+30A in Daffern’s Kananaskis Country Trail Guide (2010). Old Baldy: hike 6.4 mi RT/2830 ft gain for a breathtaking panorama, with easy creek crossings. Park along H40 just south of Kananaskis Village. See #38 in Daffern’s Kananaskis Country Trail Guide (2010). Mari Lake Trail: stroll from Elkwood Campground. Indefatigable Trail: hike 3.4-5.7 mi RT/1500-2550 feet gain for one of the best views in this exceptional area. Start from North Interlakes parking lot at the end of Kananaskis Lakes Trail road. See hikes #76+76A in Daffern’s Kananaskis Country Trail Guide (2010). Frozen Lake in Elks Lakes Provincial Park, BC: hike 8.3 mi RT/1620 ft gain steeply to gorgeous deep blue lake under Mt Fox, from the trailhead on Kananaskis Lakes Trail road within Peter Lougheed PP. See #58+58A in Daffern’s Kananaskis Country Trail Guide (2010). Three Isle Lake: hike 13.9 miles RT/1600 ft gain, a long day, optionally biking 5 miles RT from Kananaskis Lakes Trail road. See #71 in Daffern’s Kananaskis Country Trail Guide (2010). Or backpack from North Interlakes Trailhead to Forks Backcountry Campground (10 miles round trip, 800 ft cumulative gain). From Forks Campground we day hiked to North Kananaskis Pass (13 miles round trip/2700 ft) with great scenery all along the way! The next day we day hiked to Three Isle Lake (5 miles round trip/1800 ft, much easier without a heavy pack), then collected our tent and hiked back to the car. Harder alternative: a great 5+ day backpacking loop starts from North Interlakes Parking Lot via the north side of Upper Kananaskis Lake to Forks Campground, Lawson Lake, Turbine Canyon Campground, North and South Kananaskis Passes, Three Isle Lake, up to the airy heights of Northover Ridge , down to Aster Lake, then out via the south side of Upper Kananaskis Lake. Combine #69+70+71A+72+73+71 in Daffern’s Kananaskis Country Trail Guide (2010). Chester Lake + Three Lakes Valley: hike 5.2-7.8 miles RT with 1000-1800 ft gain in a delightful ramble through larch forest to lake-dotted limestone barrens. See #92+92B in Daffern’s Kananaskis Country Trail Guide (2010). Birdwood Lakes + Birdwood Pass + Tryst Lake: has breathtaking views and superb alpine zone. Adding side trip #84 Tryst Lake (with nice larches) totals 10.4-11.2 mi RT/2483-2653 ft gain; else hike 1630-1800 ft in 8.8-9.6 miles RT (or 7.8-8.6 miles via wet shortcut from H742). See #85+84 in Daffern’s Kananaskis Country Trail Guide (2010). Shorter: Tryst Lake alone is 4 mi RT/853 feet gain (#84). Nearby 1km north: Tent Ridge loop hike (6.1 mi/2700 ft gain) is one of the most enjoyable ridge walks (with some easy non-exposed scrambling). See #83 in Daffern’s Kananaskis Country Trail Guide (2010). Hike and/or helicopter-pack to Mt Assiniboine and Lake Magog (detailed further above). Buller Pass in Spray Valley PP: hike 8.9 miles RT/2200 ft gain (plus Ribbon Lake adds 2.3 mi RT plus 700 ft down & up) from H742. See #77 in Daffern’s Kananaskis Country Trail Guide (2010). huge Mt Kidd RV Park on H40 just northwest of Spray Valley PP, just 30 minutes north of Lower Kananaskis Lake and 45 minutes east of Banff. Sunny Talus Lodge (external link) is a catered premium escape to wildly spectacular hikes (guided or self) in remote wilderness, around $1500 per person for 4 nights private room & meals (in 2015), with electric generator and hot showers via bucket. The price includes a spectacular helicopter flight from Canmore or Mt Shark Road! Up to 12 guests can choose 3, 4, or 7 nights. Talus Lodge is in a dry area receiving only 25 inches of precipitation/year, far in the backcountry between Mt Assiniboine and Upper Kananaskis Lake. Add any of the above images to your Cart for purchase using my Portfolio site. Images include: A stream flowing through colorful sedimentary geology in Red Rock Canyon, and mountains reflected in Waterton Lake. Bears Hump: hike 1.8 miles RT/738 feet gain for a classic view of Waterton Lake, starting at the National Park Visitor Center trailhead, early for better photo light and avoidance of crowds. Bertha Lake: hike 8.6 miles RT/1542 feet gain starting from Townsite Campground. A good rainy day hike would be to Lower Bertha Falls (3 miles RT/574 ft gain). Akamina Ridge: loop 12-14 miles RT/2918 feet gain steeply from Forum Lake to Wall Lake over Akamina Ridge in Akamina-Kishinena Provincial Park, BC. Or else hike out and back to Wall Lake and Bennett Pass with optional side trip to Forum Lake. Carthew Traverse: ascend 2460 ft to Carthew Summit (7910 ft), descend 3670 ft to Waterton Townsite, 12.4 miles one way via public or private shuttle. We loved this colorful hike in 2002. Rowe Lakes: hike 7.5+ miles RT/1881 ft gain, optionally extending via a very steep scramble to Lineham Ridge 10.1 mi RT/3182 ft (or onwards to Lineham Lakes 12.3 mi/4500 ft RT, where you might better loop out on Lineham Creek Trail with car shuttle to save 1148 ft). Scramble up Avion Ridge to see golden larch trees starting in late September. Twin Lakes loop: day hike 15.5 miles in a loop/2133 feet gain. Or backpack: starting at scenic Red Rock Canyon, do 4-day basecamp at Twin Lakes (6450 ft elevation) climbing 1540 ft in 7 miles (or camp 1 night at Goat Lake), hiking out via Blakiston Creek & Falls. On layover days, hike high along Waterton Park’s western boundary to do any of the following: 1) Sage Pass short hike, 2) loop north on route along Avion Ridge to Goat Lake back via Bauermann Creek, and/or 3) go south to Lone Lake or South Kootenay Pass. USA: MONTANA: Glacier National Park. 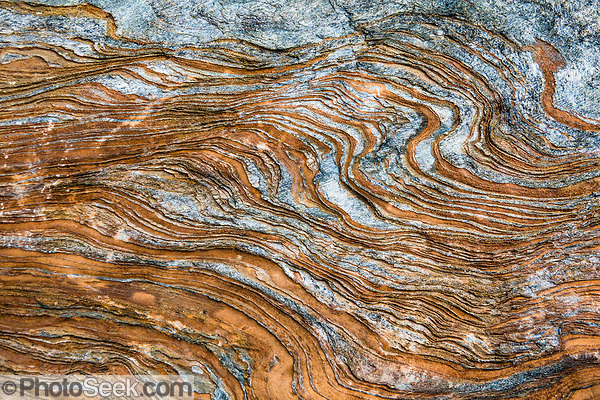 Abstract Nature Patterns of Waterton-Glacier Parks. Hike 10 km/6 miles round trip with 730 meters/2400 feet gain to Conrad Kain Hut for breathtaking views of nearby Bugaboo Glacier, soaring granite spires, larch trees, and sedimentary Rocky Mountains eastwards across the Columbia River Valley. This trail makes a fantastic day hike or awesome overnight hike with convenient shelter in Kain Hut (which for a fee provides propane stoves and space for people with a sleeping bag) or nearby campground. A few ladders and hand cables assisting this steep trail may bother those with fear of heights. Hike panoramic Cobalt Ridge, 8 miles round trip with 914 meters/3100 feet gain on a steep but well-defined trail. Two-thirds of the way up, Walter Cobb Lake (or Walter Lake) adds just 1km round trip for lunch in a forest of larch trees that will be golden in late September or early October! Don’t miss the view from the highest point of the Cobalt Ridge. Optionally continuing onward to Cobalt Lake adds 2.5 miles round trip and 150 meters/500 feet gain. Start walking from Bugaboo Septet Recreation Site campground or CMH Bugaboo Lodge or park at the marked Cobalt Lake trail head. For a more distant panorama, hike up Chalice Creek and Ridge, 16 km/10 miles round trip with 730 meters/2400 ft gain, measured starting from Bugaboo Septet Recreation Site campground, near the bridge across Bugaboo Creek, near CMH Bugaboo Lodge. For a close side view of glaciers and peaks, hike to Silver Basin, 12 km/7 miles round trip with 450 m/1500 ft gain. Go past CMH Lodge, make the next right, and park at the first switchback to avoid the short, rough 4WD road to the trail head above. Bugaboo Pass is 5.2+ miles with 2200 feet gain, or longer depending on your car’s progress up the rough dirt road. From Brisco (about 44 kms north of Invermere on Hwy 95) or Spillimacheen, follow signs to Bugaboo Provincial Park and CMH Lodge on a gravel logging road. After driving 47 kms (1.5 hours), turn right on a rougher road to reach Cobalt Lake trail head and spectacular Kain Hut trail head, or continue straight (left) along Bugaboo Forest Service Road. Before you reach the gate of luxury CMH Bugaboo Lodge, a left turn crosses Bugaboo Creek bridge: then a left reaches Bugaboo Septet Recreation Site (4 primitive campsites in a free, user-maintained campground reachable by 2WD vehicles) or straight up takes 4WD vehicles and hikers to Chalice Creek trail head. Curiously, every parked vehicle is barricaded with provided chicken wire fencing! In the past, porcupines gnawed under vehicles; but author Janice Strong says porcupines damaging vehciles is now rarely a problem for BC & Alberta vehicles since the provinces changed their winter road salt, plus porcupine populations have declined. Hike along foaming Hellroaring Creek to spectacular Lake of the Hanging Glacier (see Google maps). Drive 1.5 hours west of Radium Hot Springs on the dirt Horsethief Creek Forest Service Road. High clearance vehicle recommended. On 2018 July 19, via rough but dry roads plus two small streams crossed, our Toyota Prius V made it carefully to parking at 1 km from the trailhead, making the effort 11.7 miles round trip with 3100 feet cumulative gain. The scenic reward was worth hiking over and under 60 fallen trees each way. (click for an external PDF guide to this hike). For hikers, I recommend a 2018-updated book covering this corner of BC: Mountain Footsteps: Hikes in the East Kootenay of Southeastern British Columbia (Fourth Edition 2018). (I call it “Strong Mountain Footsteps” for short.) 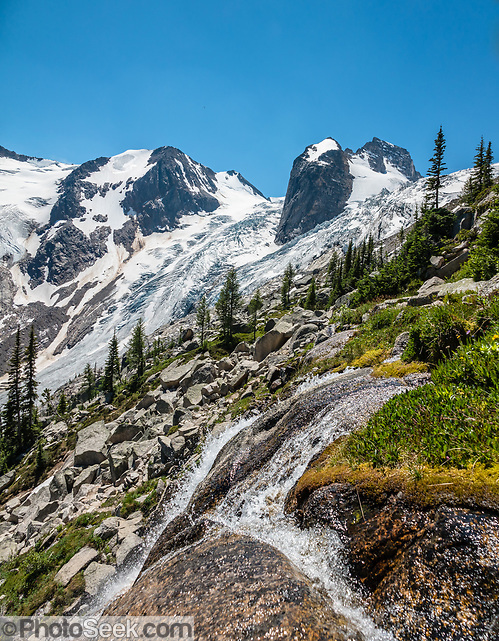 Southeast BC will attract us back to hike Jumbo Pass, Hourglass Lake, Tanglefoot Lake, and more. Revelstoke National Park has a nice place to eat lunch then stretch our legs in a natural setting on the short Skunk Cabbage Trail. Starting with a public shuttle ride from the top lot, a pleasant hike is Miller Lake 7.2 miles round trip with 500 feet gain, plus 1.5 miles to Eva Lake. In BC’s Glacier National Park, Bear Creek Falls Trail (Parks Canada) stretches your legs for 1.2 miles round trip. The easy Abandoned Rails Trail interprets Rogers Pass National Historic Site (2.4 miles round trip). Abbott Ridge trail (Parks Canada) is 8.5 miles round trip with 3400 feet gain, to an great view of Mount Sir Donald and the Illecillewaet Glacier. See my article “Pardon Me, I’ll Run to my Ambulance Now.” This true story from Bowron Lake Provincial Park recounts my group’s adventurous 73-mile canoe trip paddling a rectangular circuit of wilderness lakes, where we portaged by rolling canoes on wheels. Gillean Daffern’s Kananaskis Country Trail Guide – 4th Edition: Volume 1: Kananaskis Valley, Kananaskis Lakes, Elk Lakes, The Smith-Dorrien (2010). Recommended hikes and campgrounds in Waterton-Glacier National Parks. Glacier National Park is a hiking paradise, one of our favorite world natural areas. Since 1932, Canada and USA have shared Waterton-Glacier International Peace Park, which UNESCO honored as a World Heritage Site (1995) containing two Biosphere Reserves (1976). Add any of the above images to your Cart for purchase using my Portfolio site. Below, view more extensive galleries. Hot Showers are available at: Rising Sun Campground Store; Apgar West Entrance KOA; St. Mary Lake KOA; adjacent to Many Glacier Campground at Swiftcurrent Motor Inn; Rising Sun Inn (6 miles west of St. Mary Visitor’s Center, and 5 miles west of St Mary Campground); Waterton Park townsite campground; and others outside the park. Per site limits are 2 vehicles, 8 people, & 2 tents (where space is available) in Glacier NP. After Labor Day, all Glacier NP campgrounds are “first come first served” (non-reservable) campgrounds — arriving between 10am-1:30pm very likely gets a site. Check out time is 12:00 noon (re-register by 11:30 am). Rising Sun Campground on Lake McDonald is open thru Sept 17, 2007. Adjacent to the campground is a camp store, a casual restaurant, and token operated showers (1 shower stall for men, 1 for women). Flush toilets; dump station. $20. In August 2007, it usually filled up after 6:00pm. Saint Mary campground, $23. Flush toilets; dump station, open 5/25 – 9/23/07; first come first served after Sept 3 (sites are reservable June 1 through September 3). Fish Creek campground is closed after Sept 4, 2007. Reservable in summer, but usually doesn’t fill up. Sprague Creek Campground) is open thru Sept 17. $20. Flush toilets. Avalanche Campground is closed after Sept 4. Many Glacier Campground open thru Sept 23, then primitive (waterless) thru Sept 29. $20. Flush toilets; dump station. Filled up most days from 2 to 7:00pm in August 2007. Public showers & laundry are located behind Swiftcurrent Motor Inn’s Registration building. 3 shower stalls for men, 4 for women. Two Medicine Lake Campground: generally shaded by trees, some privacy. Open thru Sept 23. $20. No showers. If Logan Pass is closed, driving around the south end of Glacier NP on Highway 2 takes only an extra 30 minutes, by way of East Glacier, to West Glacier. Glaciers carved spectacular U-shaped valleys and pyramidal peaks here as recently as the Last Glacial Maximum (the last “Ice Age” 25,000 to 13,000 years ago). Of the 150 glaciers existing in the mid 1800s, only 25 active glaciers remain in Glacier National Park as of 2010, and all may disappear as soon as 2020, say climate scientists. See for yourself, such as the nearly-gone Siyeh Glacier at Cracker Lake. Read more about global warming and climate change. Check weather and reserve backcountry campsites at 8:00am, one day in advance, at the following offices: St. Mary Visitor Center, Two Medicine Ranger Station, Many Glacier RS, Polebridge RS, or Apgar Visiter Center. Be flexible and come prepared for alternative plans, as popular campsites may be hard to get. Backpacking permit fees are $5 per person per night (as of 2007). Advance reservation fee ($30) is waived if reserved less than 24 hours in advance. Rainy day activities include waterfall hikes, games, or a good book. Tom’s PRIORITY KEY below rates hikes with asterisks: ***Best. **Excellent. *Good if you have extra time. ** Avalanche Lake hike: park early before the lot fills. ** Bowman Lake, Numa Ridge Lookout (11.4 mi round trip, 2935 ft). See jade colored Bowman Lake and Valley from above. Drive 21 miles from Apgar to Polebridge, via Camas Road, to the “Outside North Fork Road” of which 11 miles are bumpy gravel. (Don’t take the “Inside Road”, which is very slow & bumpy, almost 4wd). From Polebridge, drive 6 miles gravel road to the trailhead at Bowman Lake Campground. * Cobalt Lake (11.4 miles round trip, 1400 feet gain) good viewpoints, attractive Rockwell Falls, colorful rocks, beautiful lake, beaver ponds, meadows. With extra energy, hike Two Medicine Pass (4.4 miles round trip, 830 feet, from Cobalt Lake) for “commanding view” of neighboring Paradise Park and Park Creek drainage. *** Piegan Pass (13 miles traverse one way with shuttle, 1720 feet up) via Grinnell Lake & Josephine Lake to Swiftcurrent Lake trailhead. Same trailhead as Siyeh Pass, at Siyeh Bend. * Otokomi Lake (10 mi round trip, 1900 ft) Deep red rocks, green forest, colorful scenery. Start at Rising Sun Campground. Open 8/9/07. *** Hidden Lake (6 mi round trip, or shorter if you don’t descend to lake, 1200 ft). We hiked this in 2002 — one of our favorite hikes in the world — well worth hiking again, this time in blue sky weather. “The parking lot at Logan Pass usually fills between the hours of 10:00am to 2:00pm, though this can vary during peak weekends.” Logan Pass (6,646 feet) is 32 miles from the west entrance and 18 miles from the east entrance. *** Swiftcurrent Pass (15.2 miles one way, backpacked in two days, 1400 feet gain, car shuttle) via Garden Wall (which can also be hiked 11.8 mi, 800 ft, one way with shuttle; plus 1200-ft, 2-mile side trip to spectacular Grinnel Lake overlook) “If you just have one day in the park, hike this”. Swiftcurrent Pass can also be day hiked 1 to 15 miles round trip, from zero or 3500 feet gain. Hiking up 2300 feet gains you a sufficiently good view. *** Iceberg Lake (9.4 miles RT, 1220 ft) (see also Ptarmigan Tunnel) Ice bergs in milky blue lake below 3000-foot cliffs. TRAIL OPEN – 8/8/07. 4.8 miles roun trip to junction above Ptarmigan Falls, plus 4.6 miles RT to Iceberg Lake. ** Ptarmigan Tunnel (11.2 miles RT, 2315 ft) (see also Iceberg Lake) Fun tunnel, spectacular scenery. 4.8 miles round trip to junction above Ptarmigan Falls, plus 5.2 miles round trip to Tunnel. *** Cracker Lake (11.2 mi RT, 1140 ft) Most eye-catching turquoise lake in park; 3000-foot cliffs; nice waterfalls. TRAIL OPEN from Cracker Flats to Cracker Lake 8/2/07. *** Grinnel Glacier (7.6 miles with boat rt, 11 miles without, 1700 ft) Gets close to the glacier, plus outstanding scenery. Open 7/13/07. Or hike Grinnel Lake, best via Piegan Pass traverse (above). * Bertha Lake (8.6 mi rt, 1542 ft) “Beautiful subalpine lake”. Falls. * Goat Lake (8 mi, 984 ft rt) “Pretty area”. This trail starts at the exceptionally colorful Red Rock Canyon (which has a nice short nature trail, seen in 2002). Spectacular peaks may distract from the wonders at your feet — ancient rock layers form fantastic, colorful patterns in Glacier National Park, Montana, USA, and Waterton Lakes National Park, Alberta, Canada. These two parks comprise Waterton-Glacier International Peace Park, honored by UNESCO as a World Heritage Site.